Eco Enterac has been operating with the current owners Peter Sweeney and Colin Jones since 1996. 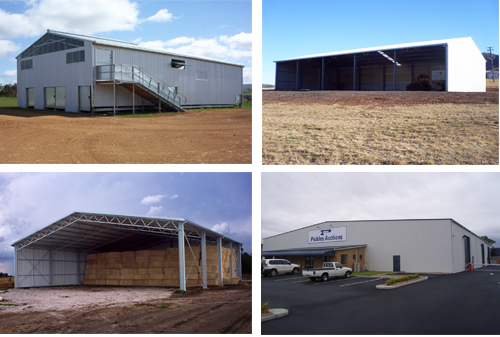 We specialise in Shearing Sheds, Machinery/Hay Sheds, Industrial/Commercial Sheds and Stockyards. Our products are made of Full Structural Steel Frames with UB columns and Open Webb Rafter with 0.47 TCT thick Roof and wall sheeting. The sheds are Custom designed to your requirements with the span and bay sizes optional. Our aim is to provide a quality product that is made to last. We are committed to ensuring that you are completely satisfied with our products and guarantee that the manufacturing will be of the highest quality. Our sheds are made from premium material and all 100% Australian steel. We are proud to engineer a full steel Australian made structure every time. Obligation free quotes will be provided with every design and will be valid for 4 weeks. Allowing you time to consider all aspects of your purchase.